After a horrendous journey through London traffic, Ben and I arrived in Slough at 5pm - only narrowly on time. Thankfully we'd given ourselves plenty of time to complete what should have been a short journey! We were met by Rob and Linzi, our key contacts, and also some of the main organisers of Aik Saath. We were pleased to see that no fewer than 22 young people had voluntarily signed up to participate in the first session. 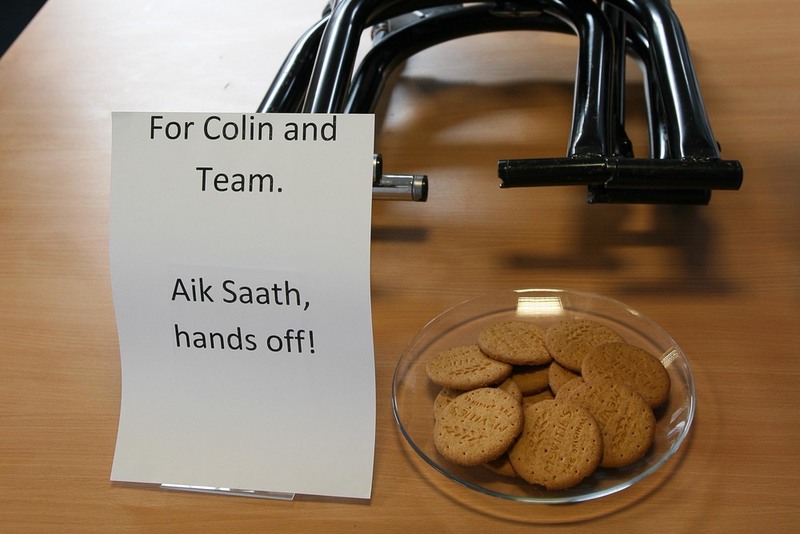 We felt very welcome, especially when we noticed that we had our own biscuits! We then split into two teams and began the practical sessions. Each group chose one person who would be responsible for documenting everything that was taught in the sessions - the idea being that these notes would be used to produce a manual to pass on to future Aik Saath trainees. Testing the Bicycle Generators, what is the expected output? Fault testing, what can go wrong and how to fix it? How many watts can the average person generate? We had a lot of fun getting everyone to sprint and seeing just how many watts each person could produce using our Power Monitor. We were really surprised when Asad generated 317 watts and won the power competition. However, everyone was surprised to learn that Asad's 317 watts would barely keep a large fridge going for the few seconds he pedaled! Generating your own energy really demonstrates just how much energy is needed for appliances that we take for granted. At the end of the practical session each team representative gave an overview of what they had learned from their respective sessions. It was great to see that each team now had a firm understanding of the concepts covered in the workshop and we thoroughly enjoyed passing on our knowledge of human powered events. Again Ben and I we were victim to the horrendous rush hour traffic which meant we arrived a little late. As we pulled into the Aik Saath car park, we were very pleased to see that many of the young people were waiting to help take our equipment up the three flights of stairs to Aik Saath HQ. Attendance to this Pedal-powered cinema organised by Aik Saath is voluntary and despite the fact that some of the young people had started back to University and were unable to attend; there was still a really good turnout. We again split into two teams and began the practical sessions. A volunteer from each group chose to continue the responsible of documenting everything that was taught in the sessions – adding to the notes that would be used to produce a manual to pass on to future Aik Saath trainees. Testing the Mini Power Station, how do you prevent the Ultra-Capacitor from being over charged? 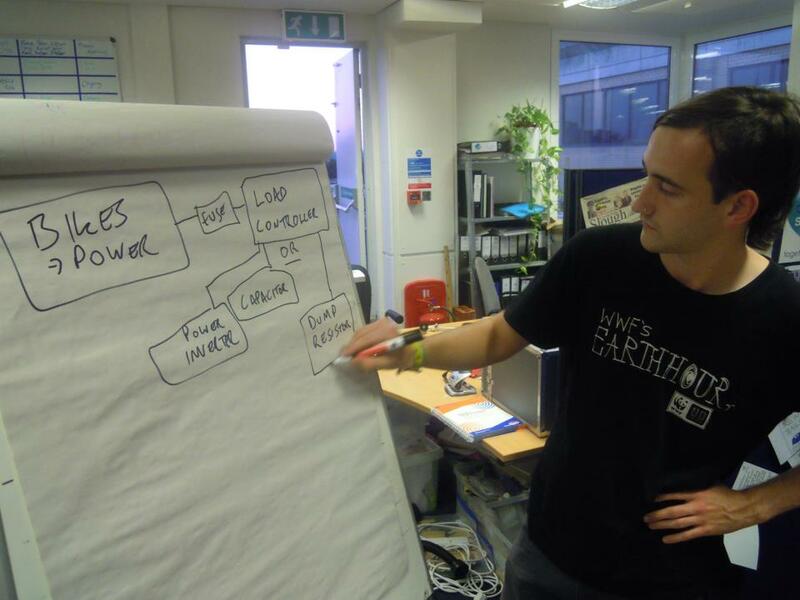 Here is Ben explaining to the group how each of the components of the Mini Power Station are connected in series in order to manage the wide range of voltages and power that it has to deal with. The circuit is quite straight forward, even for people with little to no electrical experience. Ok, with the theory out of the way it was time for the team to get their hands dirty. 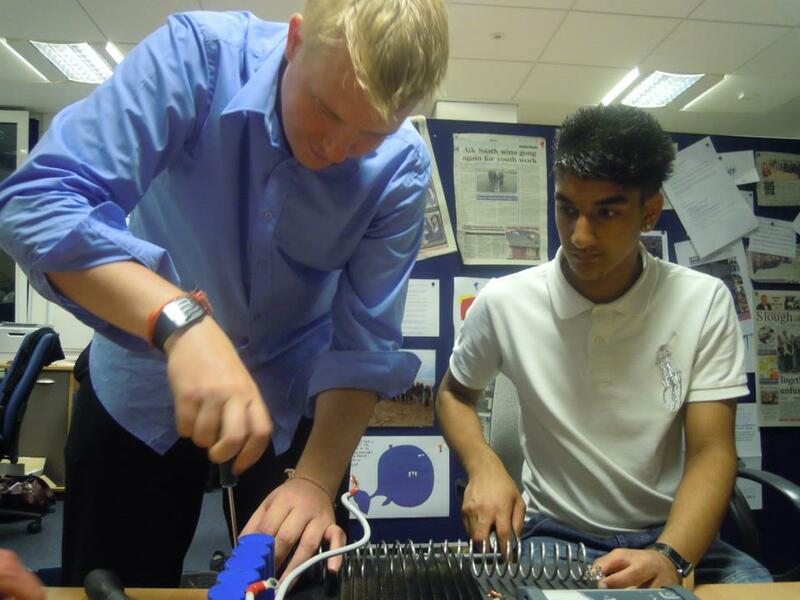 It was great to see everyone getting involved putting the Mini Power Station together. Below you can see Rob (one of the organisers) showing the young people how it’s done while putting the junction box together! So after a couple of hours hard graft and several cups of tea the fruit of the team effort are revealed, Aik Saath’s own Mini Power Station. Now just hope it works! What is the power consumption of various office items, can we power them with this equipment? Let seen what we can power using human energy! Well my team had a lot of fun running around the office working out just how much power is required to and air conditioning unit, the kettle, a disco light, the office sound system etc. We setup up the 5x bicycle generators with a second completed Mini Power Station so we didn’t have to wait for the first team and set about powering various office items. 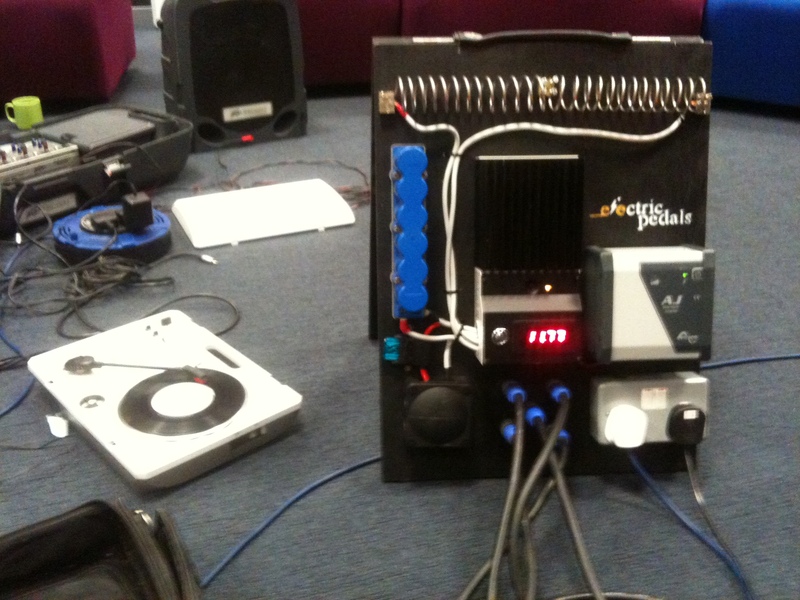 We quickly realised that the 200watt limit of the Mini Power Station with five riders would only power a handful of item, for example the PA, record player and some disco lights. 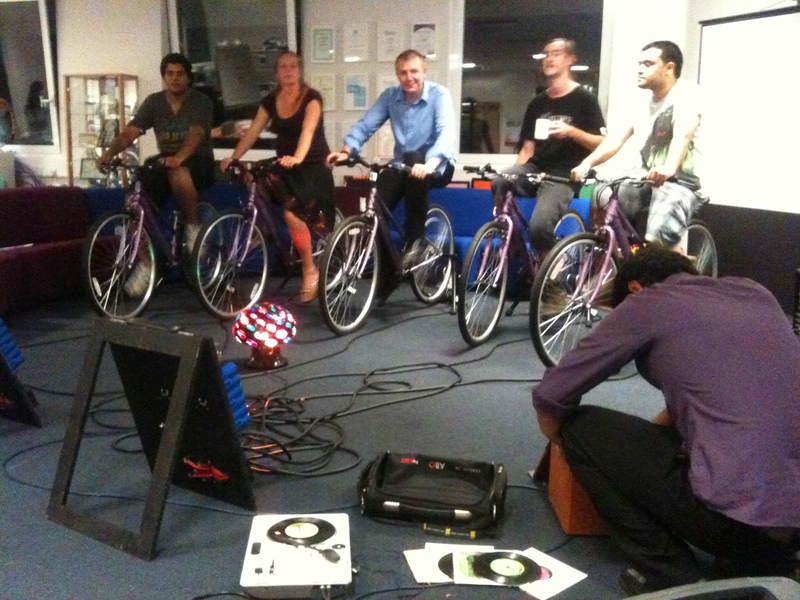 Well the session finished up with a much needed bicycle powered disco. 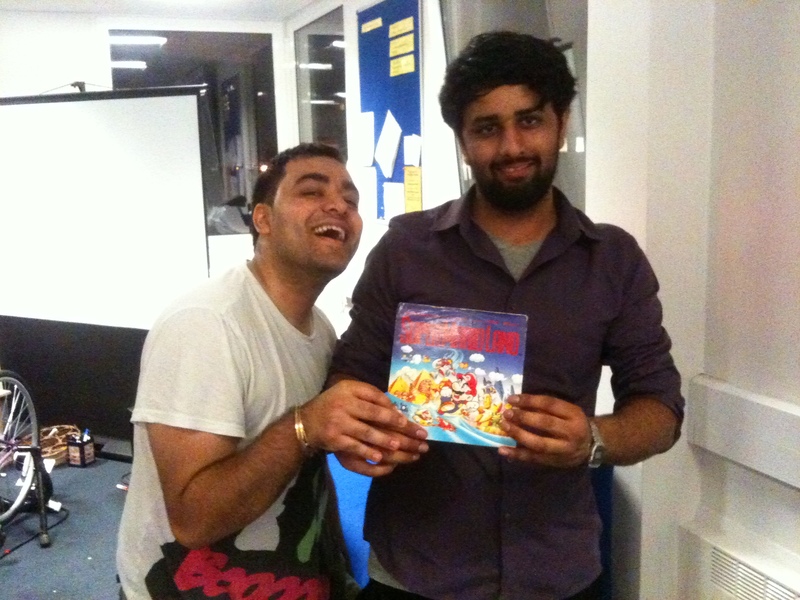 It was not long before the young people took over the music choice having spotted some of the unusual records we own. There is nothing more uplifting that turning calories into Ska music! Our Pedal Powered Field Cinema is going to DR Congo!